We now have an RPM for Gwydion 2.4.0 for x86 Linux systems. Keep those packages for your favourite systems rolling in, folks! it still lacks certain features. It’s basically our “stable” branch now, 2.5 is the current branch for new feature developments. If you have asked yourself why this site has been so quiet for the past months, there’s an easy and very exciting answer: the Functional Developer project is going Open Source, and we’ve been busy playing with the code. The official announcement is still not out yet, but we had the complete code, including the compiler and all the libraries, in our CVS for several months now, and managed to make both the Win32 and the Linux port work. So, we’re very proud to present snapshots of what is going to become Functional Developer 2.1 (or maybe Open Dylan 1.0? ), for Win32 and Linux/x86. Have fun! While we still owe the world a writeup on the DHC 2004, and an announcement of the Open Source release of the Functional Developer Dylan compiler, here’s an article by Chris Page titled Effective Dylan: 50 Specific Ways Dylan is Easier to Use Than C++. There has been a reorganization of the downloads directory. Primarily, all the binary packages have been organized by operating system, CPU architecture (if appropriate), ABI version (if appropriate), and packaging method (tar vs RPM etc). This should make it easier to find what you need without being swamped by packages for systems you don’t care about. If you find anything misplaced (and I’m not too confident with some of the older OS X versions) then please let us know on the gd-hackers mailing list or the IRC channel. To satisfy the hunger of the ever-increasing hordes of Dylan programmers, we have started generating daily snapshots of the sources and Debian binaries of the Gwydion Dylan development suite. Simply add the following line to your /etc/apt/sources.list file and let the fun begin! Note: The syntax is important. You need the trailing / character. To support funding of the Gwydion Dylan project, we’ve started to sell merchandise on CafePress. The first item you can get is a 0.45l coffe mug (that’s 15 fl oz for the imperial folks), depicting a class diagram of the central data and code flow structures of the Gwydion Dylan compiler. This is extremely useful for compiler hackers, and nice to look at for the rest. As the organizers of this year’s International Contest for Functional Programming failed to publish yet: a team of Dylan hackers won the judges prize with their entry. Congratulations, guys! Gwydion Dylan version 2.3.11 has formally been released today. Source code, as well as binaries for some platforms, can be found in our download section. We have many improvements in platform support, including workarounds for the worst bugs in gcc 3.x. Software patents threaten all free software projects, including ours. It’s worrysome that the EU tries to follow the US lead in patentability of software. The European Parliament will vote on the issue on September 1st. Help saving free software, and write to your MEP. FFII has all the information on the issue. 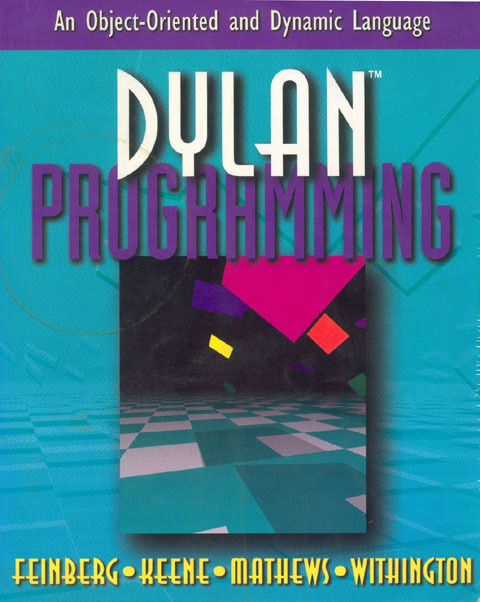 As every year, a Dylan team has participated in the International Contest for Functional Programming. The writeup of this and the last years is available here. Peter Housel vastly improved Gwydion’s floating point handling. There are now primitives to handle floating point numbers, borrowed from the CL specification. Also, we now have precise floating point reading and writing, i.e., if you write a float and then read it back, you will end up with exactly the same float again. You can find details in his message to the gd-hackers mailing list. There will be a compiler writers special interest group on the Chaos Communication Camp this summer. Some of us Dylan Hackers will be there. The Gwydion Dylan Hackers are proud to release version 2.3.10 of Gwydion Dylan. The source tarball, and binaries for Linux/x86 and Solaris/Sparc are already on the FTP servers, more precompiled binary packages (most notably MacOS X and Cygwin) will be available later. generated C code using this compiler release. Functional Developer, the commercial Dylan compiler, is now going into the third round of Alpha testing. You can find out more about this at Functional Objects. A big thanks to the Fun-O folks for releasing most of their libraries under a free license, so we can re-use them for Gwydion. channel is now known as freenode. You’re pretty likely to find us there, in case you have questions, want to help, or generally socialize. For people who value convenience when installing applications on MacOS X we now provice an installer. Gwydion Dylan on your Mac is only three clicks away! We’re proud to release version 2.3.9 of Gwydion Dylan. This is probably the last version before a 2.4 stable release, and we have made great progress towards a stable, complete, and bug-free version. Source tarball is available now from here. Binary versions for a lot of platforms will follow soon. We have moved the different services, like WWW, Mail, FTP etc. to a new dedicated server. This means improved service for you: mailing list archives work again, spam on the lists is reduced, web pages and documentation updated more often. Now back to work on Gwydion Dylan 2.3.9, to be released soon :). now online. Check it out, and help fill it with useful content. The first Dylan Hackers Conference is over. We hacked an interpreter for our low-level intermediate code, giving us a Dylan interpreter suitable for procedural macros and an interactive compiler. See this mail for more. We’ll hold our first conference at the end of the month in Berlin. See here for details. Drop by, if you think you can contribute! 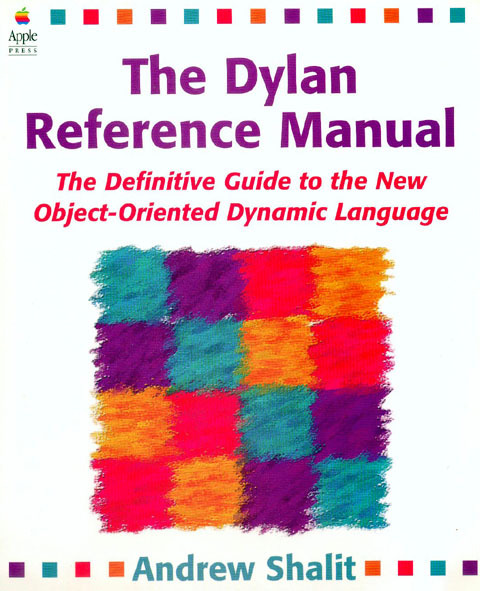 The Dylan Reference Manual describes the whole topic a bit more precisely.The most widespread introductory text (“Dylan Programming” from Feinberg et al.) also puts each-subclass slots to good use. Finally Gwydion Dylan is able to compile the examples in that fine book. We’re still not where we want to be for a stable release, but 2.3.8 is arguably the version with the least bugs and most features ever, so we recommend it for everybody who’s using Gwydion Dylan. For a detailed list of new features and fixed bugs please see the ChangeLog and the news file, as a highlight I should mention a DUIM port based on GTK (DUIM is the Dylan GUI library). The Dylan Hackers, a team consisting of some of the Gwydion Dylan maintainers, won the second prize at the annual ICFP Programming Contest. A summary of our efforts is here. Version 2.3.5 of Gwydion Dylan has been released. The compiler now generates faster and smaller code, supports more of the standard, and runs on more platforms. That’s a bunch of good reasons to upgrade :). The latest development version of Gwydion Dylan now supports class slots. You can get it directly from the CVS, or use the next daily snapshot. Also, work on c-ffi is progressing. We hope to get it out for the next release. Gwydion Dylan 2.3.4 is available now on MacOS X as well. See Rob Myers’ page here for some screenshots and sample applications. The latest version of Gwydion Dylan, release 2.3.4, is available for download. The second beta version of the d2c compiler for the CodeWarrior IDE has been released by Gabor Greif. Gwydion Dylan PPC implements the current (v2.3.4pre) codebase of d2c and now supports the symbol browser. It is carbonized and has been tested on MacOS X beta. The distribution now contains the needed support files and example applications. One highlight is “Dylan Hacker”, a raytracer, our contribution to the ICFP 2000 contest. If you have a Power Macintosh (with at least 64 MB RAM) and CodeWarrior Pro 6, you are invited to try it out. Douglas Auclair has ported the latest release of Gwydion Dylan to Win32 (cygwin, to be more precise). You can get the binary here. The source patches will be part of the next release (hopefully). An article about Dylan appeared on the Byte website. The RPMs for version 2.3.3 were broken. New ones are available on the mirrors. Gabor Greif has released the first feature complete version of the d2c compiler for the CodeWarrior IDE. Gwydion Dylan PPC implements the current (v2.3.3) release of d2c and is rather nicely integrated in its environment. If you have a Power Macintosh (with >96 MB RAM) and CodeWarrior Pro 5, you are invited to try it out. Jeff Dubrule’s OpenGL bindings for Gwydion Dylan have been modified by Andreas Bogk to run with the latest version of utah-glx. This means hardware-accelerated 3D graphics with Dylan! This is also interesting as an example for other people writing Dylan-to-C interfaces, especially those involving function pointers. Much is happening on the MacOS front of Gwydion Dylan. A new build of d2c 2.3.3 for MacOS is available, as well as a sample application for the Carbon API. After taking a look at the CVS logs I noticed that it was about time to release a new version. You can get binaries and source code at our mirror sites. on the openprojects IRC network. You can visit us there for troubleshooting and socialization. Rob Myers finally finished his port of d2c, the Dylan compiler that’s part of Gwydion, to MacOS. Great work! You can get it here, or on any of the mirror sites, once these are updated. Beta version 3 of Functional Developer, the software formerly known as Harlequin Dylan, aka the commercial implementation of Dylan, has been released by Functional Objects. It’s still Win32 only, but it has a lot of features and a nice GUI. Neel Krishnaswami has implemented lazy evaluation as known from ML or Scheme. The fact that it only took him a couple of lines tells alot about the expressive power of Dylan, and the fact that his code breaks the current version of Gwydion Dylan means that we have to do some work ;). You can find his code here or on any of the other mirror sites. are still trying to figure out what’s so special about Dylan. platforms than the already existing Win32.Good luck, guys! functional again. Addresses have changed, see here for details. source tree, or download the newest version. of one of our mirror sites. places. The long version of the announcement is here. download it from the contrib directory of any mirror site. volunteers. Thank you to everyone who helped out! release. Look for a final test version, and then the real thing! right, and Eric Kidd has rewritten getopt and cooked up some man pages. under Debian, and should have debs sometime soon. things which should be done before we have users.